Do you want to create password protected image galleries in WordPress? Sometimes you may only want to show your galleries to a specific group or an individual. You can easily add a password to your gallery, so only people with the access can view your photos. In this article, we will show you how to create password protected image galleries in WordPress. By default, WordPress image galleries are visible to the public once you add them in your post. You don’t have the option to add password protection or changing the visibility of an image gallery to private. Envira Gallery helps you add password protection to your image galleries. To create a password protected gallery, the first thing you need to do is install and activate the Envira Gallery plugin. Next, go ahead and create an image gallery. For further instructions, follow our step by step guide on how to add an image gallery with thumbnails in WordPress. After creating an image gallery, you can add password protection with Envira’s Password Protection Addon. To access this addon, you must have an Envira Plus License or higher. 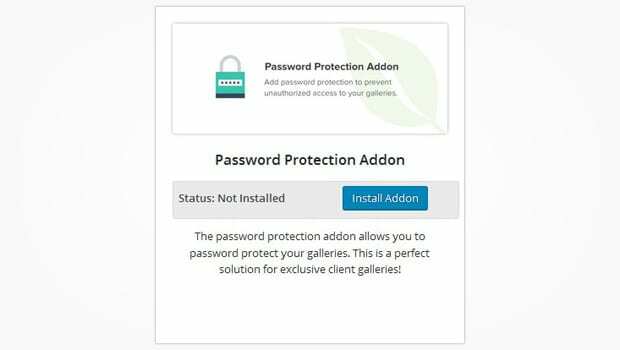 You can go to the Addons tab from Envira Gallery » Settings to install and activate the Password Protection Addon. After activating the addon, you need to edit your image gallery and change the visibility to password protected. It will ask you to enter a password. This is the password someone would need to be able to view your image gallery. Once you have selected the password, make sure to click on the Update button. Now you can visit your website and check your password protected image gallery. 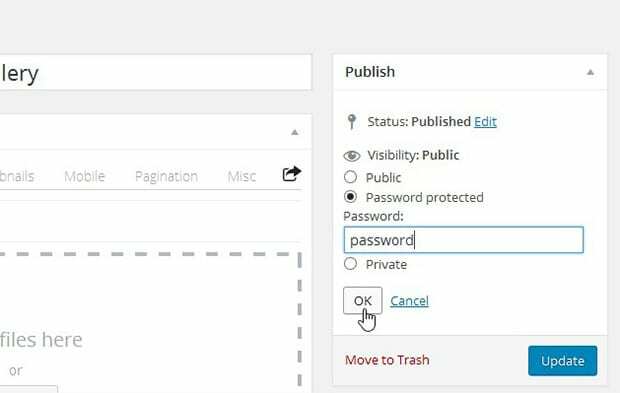 We hope this article has helped you to learn how to create password protected image galleries in WordPress. You may also want to check out our guide on how to protect your website from image theft. Hi, it will protect the Envira Gallery individual images, so we recommend you to add all images on your site using Envira. Hi, Waseem. I’m afraid that is not true. Envira Gallery don´t protect individual images. I’ve just purchased this plugin with Password Protection Addon and created a private Gallery and added all images using Envira, but everyone can access to the individual image if they know the url. Only users who know the password can see the gallery, but everyone can see the individual images. I have purchased this plugin only for this feature and I’m very dissapointed.